The website is great and the staff was very efficient in responding to our booking request. 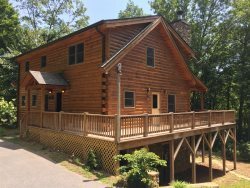 We had a wonderful experience with great smoky cabin rentals. The cabin was beautiful, very clean and secluded like advertised. The drive to the cabin was challenging but that was also disclosed to us. We can't wait till we can come back!! I called to determine the exact cabin for my family's needs. The staff was great and knowledgeable about the cabins and able to determine which one was best based on what we were looking for. It was a great experience. It was paradise! From coffee in the morning, to a late night snack. We went hiking and tubing. The little town was awesome.